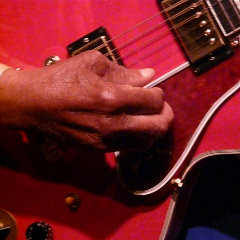 Still Singing the Blues is a two-part, two-hour radio documentary series featuring musicians in New Orleans and South Louisiana who continue to perform both traditional blues and more commercial rhythm-and-blues. Still Singing the Blues is a two-part, two-hour radio documentary series featuring musicians in New Orleans and South Louisiana who continue to perform both traditional blues and more commercial rhythm-and-blues—often despite poverty, poor health, and various types of disaster. Part 1, also called "Still Singing the Blues," burrows into the lives of three outstanding older performers: Carol Fran of Lafayette, Harvey Knox of Baton Rouge, and Little Freddie King of New Orleans. Part 2, called "Crescent City Blues," takes listeners into the handful of New Orleans neighborhood joints that keep the blues and R&B alive. The two parts can be played independently of each other.